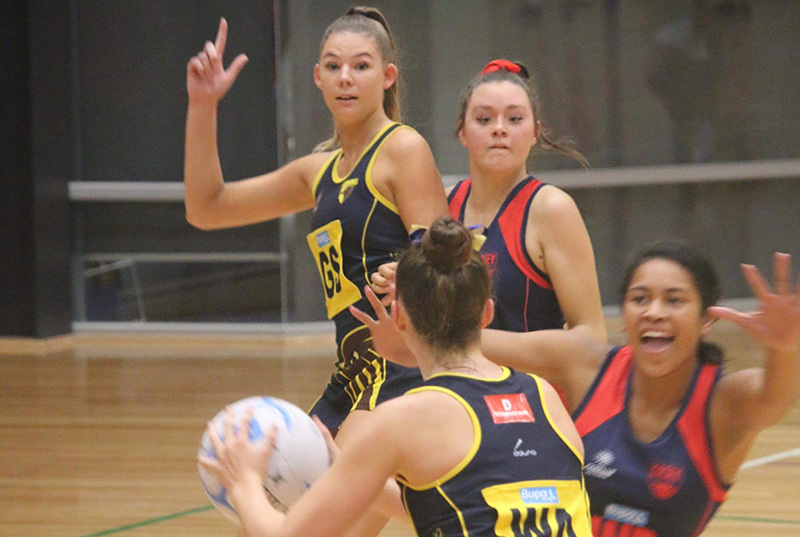 Hawks Netball’s 19/under team’s season is off and running, after they grabbed their first Victorian Netball League win of the year in Round 3 against new south-east rivals Casey Demons. All three Hawks teams made the trip to Casey Stadium for Wednesday night’s away fixture, and emerged with two wins from three games in front of a huge crowd of around 1000 supporters. In what was a must-win game for the Hawks 19/under team, which sat at 0-2 after two rounds, Round 3 presented a stunning turnaround in form. The Hawks were sharp from the outset, piling on 16 goals to 10 in the opening quarter, with goalers Ellie Karaula and Hannah Keane netting eight apiece. The lead grew to 10 at half-time as the Hawks’ defence end dug in, with goal defence Gemma Thomas turning over ball at will, wing defence Abi Inglis stamping her authority and Hawks development player Sienna Thornton stepping up and impressing at goal keeper. With young wing attack Lanni Pryor putting out her best performance of the season thus far and delivering consistent opportunities to the goalers in the second half, the Hawks added another 25 goals to run out 54-45 winners, with Keane awarded the umpires’ three votes in a commanding 23-from-28 shooting performance. The win puts the Hawks’ season back on track as they await the 2-1 Melbourne Uni Lightning in Round 4 next Wednesday night. The Hawks’ Division 1 team bounced back from a tight loss in Round 2, riding a dominant first half to a solid 14-goal win against Casey. The Hawks were in control from the first whistle, putting up 23 shots to 11 in the first quarter to carry an 18-9 lead into quarter-time. VNL debutant Emily Kay teamed impressively with Sally Deller in defence to restrict Casey to just eight goals in the second quarter and six in the third as the advantage grew to 17 goals. Casey lifted in the last quarter, but Hawks centre Jasmine Ferguson seemed to have an answer for every challenge, impacting at both ends in a best-on-court performance. Ferguson said while the match was scrappy at times in the second half, there were plenty of positive signs in the 48-34 win. “Our first quarter showed the high quality netball we can play and our defenders again showed how good they can be,” she said. For three quarters, the Hawks’ Championship team was right in the hunt against a strong and experienced Casey Demons lineup that featured former Australian Diamond Erin Bell and Melbourne Vixens tall Emma Ryde. Tied at 15-15 at quarter-time, trailing by three at the long break and eight at three-quarter time, the Hawks remained a chance to pull off an upset. But Casey found another gear in the final 15 minutes, with Ryde helping her team pour in 23 goals to 10 to seal a 74-53 final scoreline. Having faced three of the competition’s top five teams over the first three rounds, the Hawks now face a pivotal clash against Melbourne Uni Lightning in Round 4. No Replies to "RD 3 WRAP: 19/U TEAM HITS FORM AGAINST CASEY"